Update 2/19/18: This post has been updated to include the recipe/instructions for the Instant Pot. I need to update the whole blog post–content, photos, everything–except for the end result on the plate. Well, I still love family and food. I can safely say this is the most highly requested recipe on the blog, and the one that I personally make the most. For the meantime, ignore the blah, blah, blah and the photos and just skip to the bottom. That’s where the magic is. Original 2013 post (just ignore it): I love the holiday season for two reasons–family and food. I get equally excited to share and create new memories with family as I do to feed them. I want all of us to remember the day for the fun that we had together and also for the great meal we shared. Needless to say, I think long and hard about what to make for any holiday meal. This lemon risotto tops my list for any winter holiday feast. It hits the comfort food mark, but is equally light and fresh. The parmesan and arborio rice bring a nutty flavor that is perfectly contrasted by the tart sweetness of the lemon. Add some asparagus for crunch and green veggie goodness and you have one heck of an incredible holiday meal. For our past two Christmas dinners, we have made this exact risotto and topped it with seared scallops and king crab. Honest to goodness, I look forward to it all year and save it as a special holiday dish. This year, we are going to serve this risotto as a side at our Thanksgiving dinner too–it’s so good that just one holiday won’t do. Mashed potatoes and stuffing are certainly traditional and tasty as Turkey Day sides, however, if you’re looking to shake things up a little without adding any additional effort to your feast, this risotto is for you. In fact, we will be having mashed potatoes, stuffing, and this risotto. Don’t let all the hype about risotto being difficult to make dissuade you–it’s not true. It is very simple, has few ingredients, and is methodical. You can easily add it to your holiday menu…and you’ll be thankful you did. Heat the olive oil in a large nonstick skillet. Add the onions and saute over medium-high heat until the onions are tender and translucent. Add the wine and stir until evaporated, about 30 seconds. Stir continuously. Add 1 to 2 cups of chicken broth and simmer until the liquid is absorbed. Stir frequently! In the meantime, heat the butter in a different skillet. Add the asparagus and saute until just past al dente. Set aside. Add the remaining chicken broth to the risotto 1/2 cup at a time. Continue to allow the broth to be absorbed before adding more. When the arborio rice has become noticeably fat, do a taste test for done-ness. 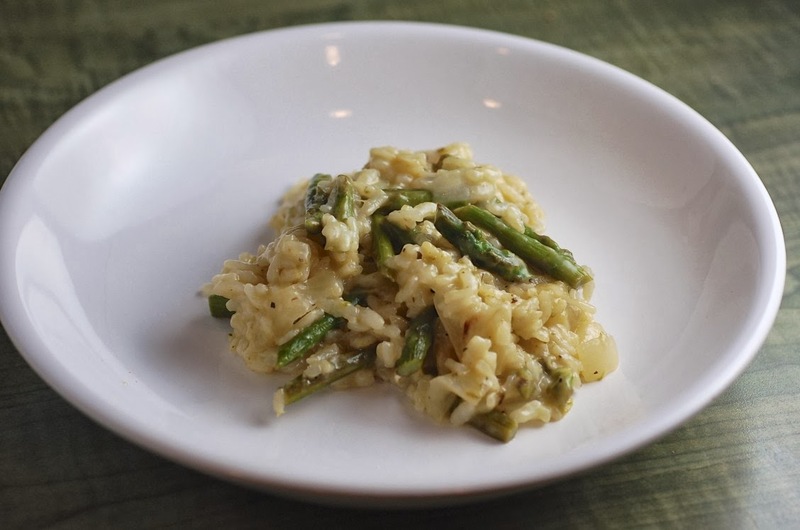 You want your risotto to be just past al dente–not crunchy, but not mushy, and not liquidy. (I taste often.) This should take about 30 minutes. 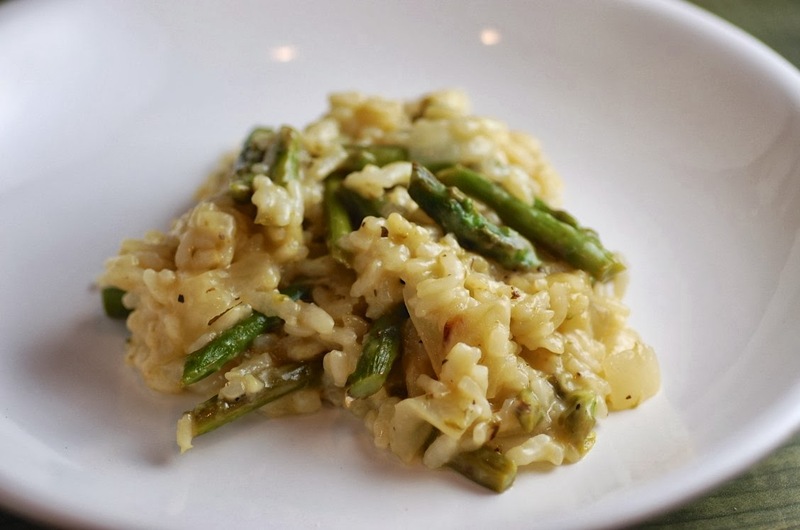 When the the risotto has reached your desired consistency, add the lemon zest, lemon juice, cheese, Italian seasoning, black pepper, and cooked asparagus. Stir to combine. Serve in a warm pasta bowl. Top with more pepper and cheese. Melt the butter in Instant Pot heated to the sauté setting. Add the diced onions and cook, stirring fairly consistently, until translucent and visibly soft. Do not let them burn or stick to the bottom of the pot. If needed, add a touch of liquid or more butter. Add the broth, about 1/2 cup of the grated parmesan cheese (I didn’t measure…I grabbed a handful), and the lemon juice. Give the whole business a final stir and make sure nothing is stuck on the bottom. Close the top, make sure the dial is on pressure. Cook on high for 6 minutes at high pressure. In the meantime, saute the asparagus in olive oil or butter on the stove until just al dente. When done releasing, open the lid. The risotto should at first appear just slightly too wet. Stir and the rest of the liquid will continue to absorb. Enjoy! And be thankful that this took less than half an hour from start to finish and you didn’t have to stand at the stove and stir and taste and stir and taste and stir and taste….